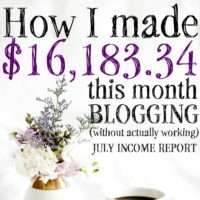 If you’re wondering why I post a blogging income report, it’s because this journey was only made possible by other bloggers posting their blogging income reports and inspiring me to give it a shot on my own. This is kind of my way of “paying it forward”. Plus, I love the fact that I work in the only industry that I know where it’s totally normal to post your income every month. 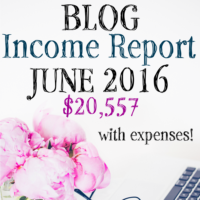 If you are a blogger, or end up being a blogger, I would love to see you post your blogging income report too! You can actually link to them in the comments below. April was one of my best months yet. The class Productivity for Bloggers by Ruth Soukup (creator of The Elite Blog Academy) paid off in a big way and income rose sharply even as pageviews continued to settle down. For the first time, I actually set myself up a 30 hour a week schedule. I usually only work 20 hours a week, but as my husband quit his job to open a brewery in Woodbridge, VA this month, I was driven to push it a little harder this month. I’m a full-time blogger. Less than 2 years ago, I had no idea that was an actual thing. To say the last two years have been a wild ride is the understatement of the year. If there’s one thing that I want to pass on to you, is that I am NOT special. I’m not crazy smart. I don’t have a writing degree and I’m certainly not a grammar expert (although a free app called Grammarly certainly helps). I just love to write and I love to help people and I’m really good at reducing our spending. So, I walk people through the baby steps that we took to completely transform our finances. I’m able to support my family making far more than I ever could in my previous career. If that sounds like something you want to do, I can help you make that a reality with step-by step instructions (for free!). You can find instructions for how to start your own blog here (even if you aren’t great with computers). The best part? Blogging is a super cheap (almost free!) hobby that makes you money! 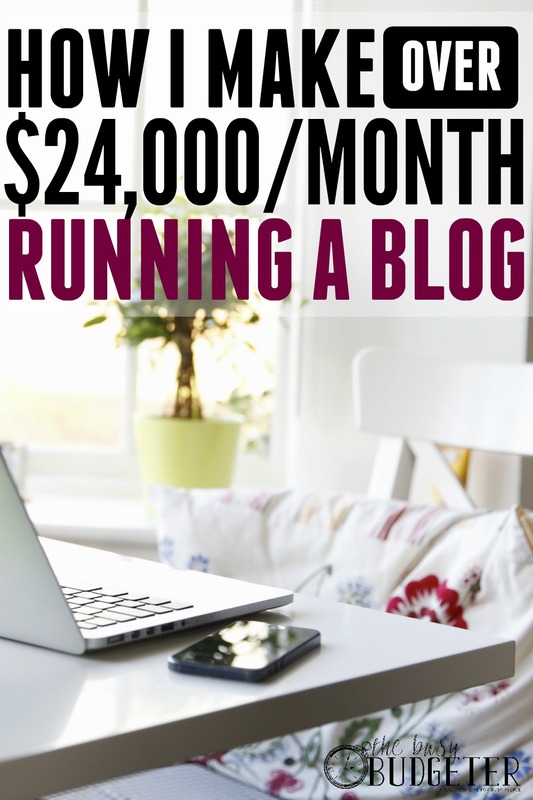 Starting your own blog isn’t very expensive. 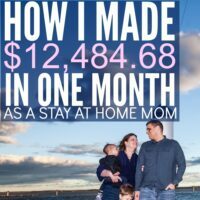 Starting a blog that makes you money while working from home starts at about $3.95/month! Pageviews are still settling a little from that crazy spike in January and I’m hoping that they’ll stick around this level for the summer and then increase in the fall. 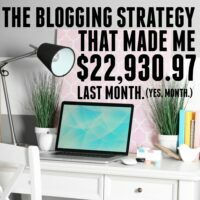 April was my most hectic month blogging yet where I worked at least 30 hours a week and really focused on optimizing affiliate income. I realized quickly that no matter how many pageviews I have, I was under-monetized with affiliates. Meaning, that I could have been making a lot more if I optimized my posts for affiliates. So, I spent the month doing that and it paid off in a big way. I started offering coaching on a case by case basis. I get almost all of my pageviews from Pinterest with a system (using Boardbooster) that only takes me 4 hours a month to maintain. That system has a lot to do with how I can grow the business with the number of hours that I work each week (about 20 hours/week, always under 30 hours). You can email me at busybudgeter@gmail.com for more information. You should be able to walk through it and implement my Pinterest strategy step by step all on your own. I have videos available for anything that you'll need extra help on. It's listed in the order you need to implement it and it's appropriate for anyone, from someone whose never heard of Pinterest to someone that's already dominating Pinterest and just wants to see how my strategy is different from theirs. Not only is it a fraction of the cost of coaching, but I'm also including The Ultimate Brand Cheat Sheet for free to anyone that purchases The Pinterest Strategy Guide until Tuesday night (6/28/16) at midnight eastern time. Email your receipt to busybudgeter@gmail.com to collect by then. You can grab the Pinterest Strategy Guide right now by clicking here. Facebook Strategy: We rocked this! We implemented the strategies in the book Strategies Worth Sharing and the results were so exceptional that I’m talking about it below in the “what worked this month” section. Launch a second opt-in: For the third month in a row this was a fail. Which was frustrating. I switched to Convertkit this month and it took a lot longer than I expected. I got overwhelmed learning an entirely new mailing system and had enough on my plate without adding a new autoresponder sequence to the mix. Side note- I love Convertkit and I should have switched from Mailchimp eons ago. Facebook Strategy from Strategies Worth Sharing: I spent April working my way through Strategies Worth Sharing:How I Grew my Facebook Page from 2,000 to 100,000 in 5 Months with my VA. It’s been an awesome resource for us as we continue growing a platform that just isn’t intuitive to me. Which is a nice way of saying that Facebook makes me want to throw my computer off of a cliff. I was expecting an increase, but was completely blown away by the results that we got in such a short time! Our fans increased by 43.6% in April over March and our engagement went through the roof with a 3,789% increase! After only a month, this book was a huge win! Brainstorming Sessions: In addition to emailing myself post ideas as I get them (always in weird places like the shower), I also had a 3-hour long brainstorming session where I started with the problems of my target audience and worked backward to find them solutions. It was my best brainstorming session yet and I’m excited to get those posts out there to them. Mailchimp- I switched to Convertkit for a few reasons. I wanted to be able to have some of the advanced tagging features. I wanted to avoid the spam trap that seems to plague Mailchimp. Mailchimp came out with new regulations that they may (or may not depending on who you listen to) limit affiliate marketing. They shut my account down for 8 hours a few months ago for an error. While it ended up being no big deal, the lack of instant customer service was a deal breaker for me. I’ve been thrilled with Convertkit and really glad that I made the switch. Plus, my open rate started soaring… which is fun to see. Google Calendar: I’ve been a long time user of Google Calendar for my editorial calendar but I’ve stopped checking it frequently as my schedule changes. I’m now to the point where I think I need to move on and look at other options. Part of the need for change is because I started working in monthly batches. So I schedule all of the posts for next month in a single day and don't need to check the calendar as often. Without that need to check, I’m missing other reminders in there. The other part of the issue that I have an in-depth blogging notebook that I love and things are leaking into that calendar. So, I’m checking out Asana for the future, and recognizing that I need to make a change there. Instagram tracking: I’m only recently getting into Instagram when I happened to pop over there for a sponsored required post and realized that I somehow amassed 500 followers with absolutely no effort (or content) on my part. I’m not a native user of the platform so I’m running some experiments to drive traffic this month to see if that’s something that I want to invest time in for the future. Autoresponder: I’ve been getting between 3,000-4,000 new subscribers a month with my current opt-in, and I have a new one being released this month that I’m hoping will eventually double that. This goal was just moved over from last month. Convertkit is up and running now so this WILL get tackled this month! I earn income in three major categories with my blog. I’ll run over my strategy for each of them. You really need to be self-hosted in order to be blogging for full time income. It makes a huge difference! It's super cheap (Only $3.49/month if you go through this discounted link) but means that you have full control over everything and can customize everything. It also helps you look professional, which is helpful both to attract readers and sponsors. I focus most of my sponsored post efforts on reaching out to brands that I use and love and offering a sponsored post package at a rate that’s a little lower than “industry standard” (which is highly debatable). That let’s me increase the “yes!” emails I get in response, and ensures that I can count on making a certain amount every month on sponsored posts while still being really picky about which brands that I’ll work with. I also go through each of my brand networks (places like Tapinfluence and Clever Girls) to see if there are any assignments that would be a good fit for my blog. In general, more pageviews equal more ad earnings. I use Adthrive (you can apply with them once you have 100,000 pageviews) and love them. My RPM (The ad revenue that I get per 1,000 pageviews) bounces between $6.40 and $10.00 depending on the season. I increase my pageviews by marketing my blog content through Pinterest using a fantastic tool called Boardbooster. I a/b tested everything on Pinterest (and still do) for about 6 months until I figured out a system that works for me. My favorite thing about Pinterest (at least with Boardbooster) is that I spent only 4 hours a month running my Pinterest Strategy. That leaves me tons of time to grow in other areas. I focus on a core group of affiliates that I think almost everyone in my target audience should be using. Since I run a budgeting website, I factor cost into the equation. If something is a great product, but is too expensive for my readers, I likely won’t add them to the core affiliates list. Having the core list lets me easily track special sale dates that my readers should miss and lets me focus without getting overwhelmed with the barrage of affiliate “offers’ hitting my inbox daily. To me, the key to affiliate marketing is to never ever promote anything that you haven’t used yourself and you don’t love. My philosophy is that if you only promote companies and products that you would tell your best friend about enthusiastically, then you’re doing it right. If you want to see my full list of blogging resources that I use, you can find them here. Need a step by step guide on how to start a blog? You can find one by clicking here (you don’t even need to be great with computers!). If you publish your own blogging income report, link to it below in the comments so we can all see! Rosemarie, thanks so much for sharing these. I enjoy reading about your strategies, what worked and what didn’t, and your goals. Very inspiring! Thanks Cam! I’m glad to be able to help! The Busy Budgeter recently posted…How do you find where people are clicking on your blog? I sooooooo enjoy your writings, as you inspire and help me focus and plan. Hey, I text & screenshot (instead of email) myself all the time now for my “NEXT STEP” file! Thank you and praying for your continued success & happiness. Thanks Gail! I’m thrilled to be able to help! I think she was planning for a summer release but I’m not sure. It’s AMAZING. AMAZING. Thanks for listing your report! Very inspiring to a relative newbie like myself. Do you have any posts on reaching out to brands? I’m having a hard time finding companies I’d want to work with via sponsored post companies (i.e. Izea). Thanks! Visiting from Work It Wednesday. I loved reading your income report! I am really new to blogging (only started in February of this year), so this gives me a lot of hope. I also write about budgeting and finance related issues, but I find myself struggling on the topics (categories) I write about. I guess I am still learning about how to organize my content. This post had a ton of great information. Still have no clue about sponsored posts but I hope one day to post an income report like this. I loved this article! I’ve just started my blog (actually waiting to get it all set up via Bluehost) and once I got started, I decided I wasn’t sure about it at all. Reading your article made me feel better! Thank you for the wealth of information! You are amazing! I have one year before my son goes to full day kindergarten and my goal is to be able to help contribute by working on my blog from home. I don’t make anything yet and I’m really trying to get going on my blog. There is so much to do, it seems a bit overwhelming! What is the first and/or number one thing you would recommend someone to work on. Thank you! This is quite impressive! I like how you broke everything down. I need to learn how to do better marketing with affiliate related stuff. I’ve got a LONG list of stuff that I’m an affiliate member of, but my approach must not be strong enough. Thanks for sharing this every month. I think it’s time I start doing more sponsored stuff. Your incomes posts always give me new ideas. Now onto increase PVs! Aja McClanahan recently posted…Small Business Owner? Freelancer? Solopreneur? Get Paid Faster with These Tips! Blog goals right here! I’m only 10 months into blogging and 4 months into EBA, so I’m not being too hard on myself. But seriously, 150% blog goals! I love following your growth and progress! I’m already making over $600/month after starting just a few months ago. Not quite your level of success just yet but certainly something to strive for. Thanks for sharing! what website do u use to start to blog?? help me.. pm me at jamalhazard10@icloud.com..
First, I want to thank you for this post. Second, I want to say that I almost didn’t read it. I thought it was going to be like every other blog income report I have ever read. Where they tell you how much they made with each type of marketing, but they don’t tell you their thought process, or what they focused on and why. Yours was refreshingly different. I have pinned it and will be going back to it as I figure out my own way in this blogging world. Best wishes! You say $24 THOUSAND a MONTH??? Right now, I don’t even have enuff grocery money! What ad tool do you recommend for new blogs starting out with less than 100k pageviews? Abd exactly what does it and AdThrive do? Your experience sounds very interesting, I would like to be more informed about it. Wow, thats inspiring! Thank you for linking up with us at #HomeMattersParty. We would love to have you again next week. Hi! Found you thru the linkup party over on Ducks’n a Row. Thanks for sharing the tips. I am very new, just started my blog endof May, but learned so much already! I set a goal to try to monetize my blog by end of June. We’re glad you shared this valuable information with us at Merry Monday. Pinning for future reference. Thank you for sharing this article. I plan to read and re-read it! I’m also an EBA member and just started blogging a couple of months ago. Amazing post!I decided I wasn’t sure about it at all. Reading your article made me feel better!Do you have any posts on reaching out to brands? I am thankful to your for your great contribution. I just found you on Pinterest. I’m excited to follow you and try some of your strategies. I’m new to blogging and need all of the help I can get! Thank you so much for sharing! Interesting article (if that is the correct term). I am wondering, though, because you said you are a full time blogger then you wrote “we”. Do you have staff? I am curious about blogging and how it works which is the reason for the question. This blows my mind. The fact that you make that kind of money in a MONTH is crazy to me. Reading this makes me feel like there is hope for me yet to see some income from my blog. So far I have not made anything on my blog but I am really new to blogging and my blog itself is only a few months old so I keep pecking away, adding content, and reading reading reading in order to learn from all the other bloggers. I am a little bummed out because I just added Mailchimp to my blog and now I feel like maybe that was a bad choice and after reading this am going to go check out convertkit as you suggested. Well thank you very much for sharing all of your information and ideas, it is very inspiring. Very interesting report. $4500 using AdThrive is awesome. I bet it is not possible with AdSense or any other ad networks. I hope they will reduce the eligibility criteria to 50k instead of 100k. Thank you for sharing your income report. It will keep your fellow bloggers like me get motivated to continue this wonderful journey. Very interested…. I have been following for a little while now. Went back and read previous posts. I am thinking about trying your plan and strategies. Wow, you are killing it with those affiliates! I am just starting my blog, and so far only have amazon. I’m not even 100% on my niche yet… not really sure what I want to post about. My first thought is home remodeling, decorating and diy. I’m always in a state of rebuild. I am a new mother working a full time job, and my heart absolutely breaks every morning mon-fri when I see my baby smiling up at me from his bassinet knowing that I am about to quickly change his diaper, get him dressed and set him in his carseat to leave him for 8 hours at the babysitters. I stumbled across your blog at work desperate to find a way to stay home with my son, and I am inspired. I will be following closely! I have been thinking of AdThrive. I just need to increase my pageviews. You are such an inspiration with how you turned your blog in to such a thriving business for your family! I’ve been blogging for almost 6 years, and haven’t yet seen such progress as you! You’ve done just wonderful! Oh man, this is so incredible. Congrats on your success! I’ve been blogging and freelance writing since 2012, and I’m nowhere near hitting numbers like yours. Lately I’ve been focusing more on writing blog posts for clients on Textbroker, and I’m making more money than ever, but it’s still a long way from where I need to be. Plus, it’s active income and not passive, so there’s no way to leverage my efforts and scale it up, other than simply putting in more hours. Anyway, I love your blog here!